Almost all the victims were schoolchildren and it is thought that nine bodies still unaccounted for may be trapped inside. 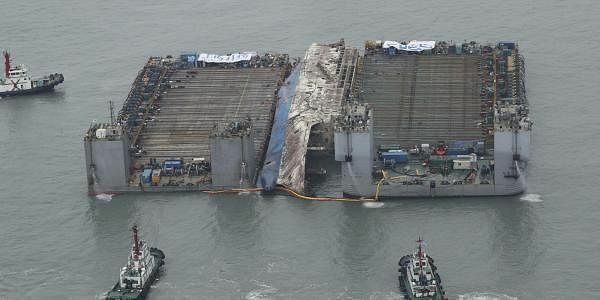 JINDO: South Korea's sunken Sewol ferry was one step closer to reaching port today after it was hauled onto a giant heavy lifting ship, Yonhap news agency reported, ready to be towed from its watery grave. Nearly three years after it went down killing more than 300 people, the wreck was safely placed onto a semisubmersible ship that will finally bring it to shore, Yonhap cited the government as saying. "The vessel was successfully loaded onto the semisubmersible ship as of 4:10 am (local time)," completing one of the most delicate stages of the salvage operation, the Ministry of Oceans and Fisheries told the agency. It will take two or three days for the hull of Sewol to be secured to the Dockwise White Marlin, a huge vessel that had been standing by in deeper waters to bring it to Mokpo on the mainland, for investigations and a search. The 145-metre ship was brought to the surface in a complex salvage operation believed to be among the largest recoveries ever of a wreck in one piece, a key demand of the families of the dead. Almost all the victims were schoolchildren and it is thought that nine bodies still unaccounted for may be trapped inside. After the ferry safely leaves the accident site, the ministry said divers will search the waters and seabed for any remains. Underwater fences surrounding the area where the Sewol sank have been installed. It came as the third anniversary approached of one of the country's worst-ever maritime disasters, which dealt a crushing blow to now-ousted president Park Geun-Hye. Investigations into the disaster, in which 304 people died, concluded it was largely man-made -- the cumulative result of an illegal redesign, an overloaded cargo bay, inexperienced crew and a questionable relationship between the ship operators and state regulators. Several relatives yesterday watched the much-anticipated operation unfolding from a boat near the site. A flotilla of powerful tugs towed the wreck, lying on its side on a platform between two giant salvage barges, towards the semi-submersible. Once secured on the vessel, it will take a day to reach port.